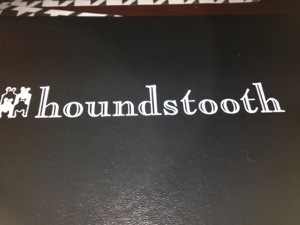 Now we all know that New York is one of the food capitols of the world, but that doesn’t mean you will always receive superior service or amazing food, and that exception was prominently present at Houndstooth in Manhattan, New York. To begin with I would never suggest that anyone drive and search for parking unless you have some extra arms and legs you wanna spare, because that is exactly what it will cost you…so when in New York, do as the New Yorkers do and cab it. Whenever you try a new place it is always the luck of the draw. 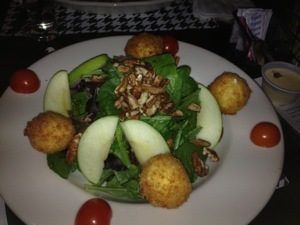 So on this daring night I opted to order a salad with goat cheese fritters, granny smith apples, pecans, & apple cider vingegarette. I tried to swap out the pecans, simply because I am more of a pistachio kinda person, but no substitutions here. My immediate attraction to this dish was not only the ability to get my leafy greens in for the day, but the goat cheese fritters, which in reality was a ball not a fritter. 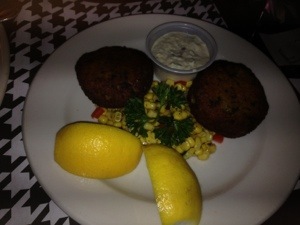 The ensemble of the dish was lack luster, the greens were limp and the dressing did nothing to enhance the flavor; but I have never been known to quit at a starter, so I ordered the crab cake appetizer, with my fingers & toes crossed I prayed for the best. Now I have made many mistakes in my life so I need to go ahead and add the crab cake appetizer to the list just to make the tracking system fair. This crab cake was not lump meat as the menu indicated, it was claw and tons and tons of filler, so much filler that whatever crab meat there was it was totally masked. It was clearly frozen and seated in scorching hot oil, because the crust was on the dark side. Everyone who knows me knows I am a “sender backer,” but I only do this when I believe in the cooks propensity to get it right..well my confidence was low and my desire for a complete debacle was even lower. I would usually stop at my description of the food, but you know service is a big deal in a dining out experience and unless it was especially crappy I would not mention it…IT WAS ESPECIALLY CRAPPY. The waitress had not taken supplement of gingko kaloba, so the downfall of that is getting the order wrong multiple times, then to boot she was the type of waitress who was not the most attentive, so make sure you do not drop your fork here at Houndstooth Manhattan, New York because you will not be getting a new one for quite a while.